Track down the Rogul in Axl’s powerful three-in-one Rumble Maker! Activate the drills to grind down the Stone monsters, then flip out the wings, release the Axl Bot’s tank and switch into jet mode for more high-flying LEGO® NEXO KNIGHTS™ adventures. Includes three scannable shields for the NEXO Powers Drop the Beat and Rock Twister, and Forbidden Power Wrecking Wrath. Price is 22% above the initial Lego retail price! This comes down to 13.99 cent per brick. 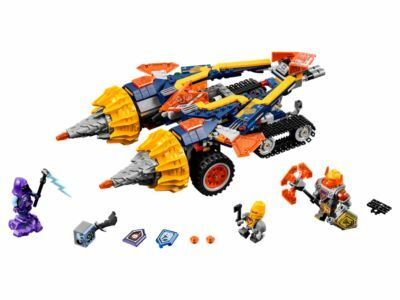 The Axl's Rumble Maker (70354) Lego set is no longer directly available from the sites below. However, 3rd party partners of these sites might still have the set available. Alternate description Keep trouble at bay with Axl’s 3-in-1 Rumble Maker! Includes 3 minifigures: Axl, an Axl Bot and a Rogul, plus a Brickster figure. Features 2 spinning drill weapons, flier with flip-out wings, detachable tank with caterpillar tracks for the Axl Bot, 2 minifigure cockpits, shield holder and a weapon holder. Roll the vehicle forwards to activate the drills and pulverize the Stone monsters! Push the cylinder to flip out the wings, then release the tank to switch into jet mode. Weapons include Axl’s axe, the Axl Bot’s axe and Rogul’s lightning sword. Combine the detachable tank with any LEGO® NEXO KNIGHTS™ Battle Suit to create an ultimate battle suit. Axl's Rumble Maker with wings folded measures over 3” (9cm) high, 11” (29cm) long and 6” (16cm) wide, and over 9” (25cm) wide with wings flipped out.